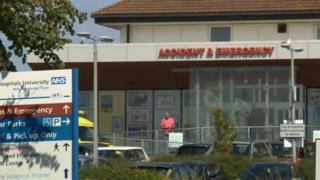 Four men have been charged over damage to cables that left a hospital's emergency department without power. Ambulances were diverted from The Queen Elizabeth The Queen Mother Hospital (QEQM) in Margate and patients were urged not to attend A&E during the shutdown. The men have been charged with criminal damage with intent to endanger life and attempted theft. They were arrested in Birmingham on Thursday afternoon. Patients were moved into other hospital departments and Kent Fire and Rescue Service provided emergency lighting after electricity lines were damaged on Wednesday at about 19:15 GMT. Noel Mahoney, 23, of Old Willow Close, Bow, London. Patrick Kiely, 35, of Devons Road, Bromley By Bow, London. They are due to appear at Birmingham Magistrates' Court.